Side view of the stele "fingertip". The Code of Hammurabi is a well-preserved Babylonian law code of ancient Mesopotamia, dating back to about 1754 BC. It is one of the oldest deciphered writings of significant length in the world. The sixth Babylonian king, Hammurabi, enacted the code, and partial copies exist on a human-sized stone stele and various clay tablets. The Code consists of 282 laws, with scaled punishments, adjusting "an eye for an eye, a tooth for a tooth" (lex talionis) as graded depending on social status, of slave versus free man. Nearly one-half of the Code deals with matters of contract, establishing, for example, the wages to be paid to an ox driver or a surgeon. Other provisions set the terms of a transaction, establishing the liability of a builder for a house that collapses, for example, or property that is damaged while left in the care of another. A third of the code addresses issues concerning household and family relationships such as inheritance, divorce, paternity and sexual behavior. Only one provision appears to impose obligations on an official; this provision establishes that a judge who reaches an incorrect decision is to be fined and removed from the bench permanently. A handful of provisions address issues related to military service. The code was discovered by modern archaeologists in 1901, and its editio princeps translation published in 1902 by Jean-Vincent Scheil. This nearly complete example of the Code is carved a diorite stele in the shape of a huge index finger, 2.25-metre (7.4 ft) tall (see images at right). The Code is inscribed in the Akkadian language, using cuneiform script carved into the stele. It is currently on display in the Louvre, with exact replicas in the Oriental Institute at the University of Chicago, the library of the Theological University of the Reformed Churches (Dutch: Theologische Universiteit Kampen voor de Gereformeerde Kerken) in The Netherlands, the Pergamon Museum of Berlin and the National Museum of Iran in Tehran. Hammurabi ruled for nearly 42 years, c. 1792 to 1750 BC according to the Middle chronology. In the preface to the law, he states, "Anu and Bel called by name me, Hammurabi, the exalted prince, who feared Marduk, the patron god of Babylon (The Human Record, Andrea & Overfield 2005), to bring about the rule in the land." On the stone slab there are 44 columns and 28 paragraphs that contained 282 laws. The stele was probably erected at Sippar, city of the sun god Shamash, god of justice, who is depicted handing authority to the king in the image at the top of the stele. 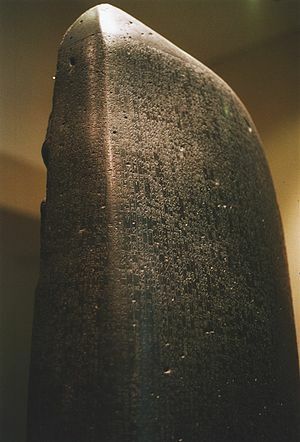 In 1901, Egyptologist Gustave Jéquier, a member of an expedition headed by Jacques de Morgan, found the stele containing the Code of Hammurabi in what is now Khūzestān, Iran (ancient Susa, Elam), where it had been taken as plunder by the Elamite king Shutruk-Nahhunte in the 12th century BC. The Code of Hammurabi was one of several sets of laws in the ancient Near East. The code of laws was arranged in orderly groups, so that everyone who read the laws would know what was required of them. Earlier collections of laws include the Code of Ur-Nammu, king of Ur (c. 2050 BC), the Laws of Eshnunna (c. 1930 BC) and the codex of Lipit-Ishtar of Isin (c. 1870 BC), while later ones include the Hittite laws, the Assyrian laws, and Mosaic Law. These codes come from similar cultures in a relatively small geographical area, and they have passages which resemble each other. Figures at top of stele "fingernail" above Hammurabi's code of laws. The Code of Hammurabi is the longest surviving text from the Old Babylonian period. The code has been seen as an early example of a fundamental law regulating a government — i.e., a primitive constitution. The code is also one of the earliest examples of the idea of presumption of innocence, and it also suggests that both the accused and accuser have the opportunity to provide evidence. The occasional nature of many provisions suggests that the Code may be better understood as a codification of Hammurabi's supplementary judicial decisions, and that, by memorializing his wisdom and justice, its purpose may have been the self-glorification of Hammurabi rather than a modern legal code or constitution. However, its copying in subsequent generations indicates that it was used as a model of legal and judicial reasoning. Hammurabi stele at American Museum of Natural History, New York, 2012. Various copies of portions of the Code of Hammurabi have been found on baked clay tablets, some possibly older than the celebrated diorite stele now in the Louvre. The Prologue of the Code of Hammurabi (the first 305 inscribed squares on the stele) is on such a tablet, also at the Louvre (Inv #AO 10237). Some gaps in the list of benefits bestowed on cities recently annexed by Hammurabi may imply that it is older than the famous stele (it is currently dated to the early 18th century BC). Likewise, the Museum of the Ancient Orient, part of the Istanbul Archaeology Museums, also has a "Code of Hammurabi" clay tablet, dated to 1750 BC, in (Room 5, Inv # Ni 2358). In July, 2010, archaeologists reported that a fragmentary Akkadian cuneiform tablet was discovered at Tel Hazor, Israel, containing a c. 1700 BC text that was said to be partly parallel to portions of the Hammurabi code. The Hazor law code fragments are currently being prepared for publication by a team from the Hebrew University of Jerusalem. Ex. Law #22: "If any one is committing a robbery and is caught, then he shall be put to death." Ex. Law #196: "If a man destroy the eye of another man, they shall destroy his eye. If one break a man's bone, they shall break his bone. If one destroy the eye of a freeman or break the bone of a freeman he shall pay one mana of silver. If one destroy the eye of a man's slave or break a bone of a man's slave he shall pay one-half his price." Hammurabi had many other punishments as well. If a son strike his father, his hands shall be hewn off (translations vary). Urukagina – Sumerian king and creator of what is sometimes cited as the first example of a legal code in recorded history. Editio princeps: Scheil, Jean-Vincent (1902). 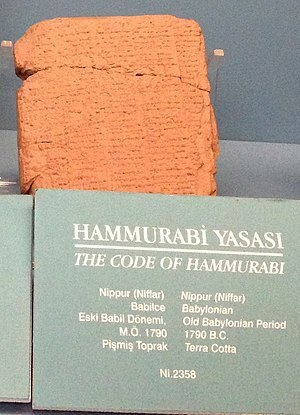 "Code des Lois de Hammurabi". Memoires de la delegation en Perse. 4 (Textes Elamites-Semitiques). Driver, G.R. & J.C. Miles (2007). The Babylonian Laws. Eugene: Wipf and Stock. ISBN 1-55635-229-8. Roth, Martha T. (1997). Law Collections from Mesopotamia and Asia Minor. Atlanta: Scholars Press. ISBN 0-7885-0378-2. Bryant, Tamera (2005). The Life & Times of Hammurabi. Bear: Mitchell Lane Publishers. ISBN 978-1-58415-338-2. Mieroop, Marc (2004). King Hammurabi of Babylon: a Biography. Cambridge: Blackwell Publishers. ISBN 978-1-4051-2660-1. Hammurabi, King; C. H. W. Johns (Translator) (2000). The Oldest Code of Laws in the World. City: Lawbook Exchange Ltd. ISBN 978-1-58477-061-9. Falkenstein, A. (1956–57). Die neusumerischen Gerichtsurkunden I–III. München. Elsen-Novák, G./Novák, M.: Der 'König der Gerechtigkeit'. Zur Ikonologie und Teleologie des 'Codex' Hammurapi. In: Baghdader Mitteilungen 37 (2006), pp. 131–156. Julius Oppert and Joachim Menant (1877). Documents juridiques de l'Assyrie et de la Chaldee. París. Thomas, D. Winton, ed. (1958). Documents from Old Testament Times. London and New York. 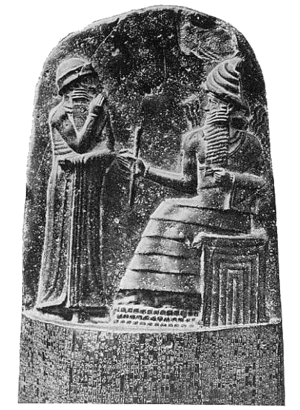 Wikimedia Commons has media related to Code of Hammurabi. Look up Hammurabi in Wiktionary, the free dictionary. The Code of Hammurabi Translated by L. W. King. Charles F. Horne, Ph.D. (1915). "The Code of Hammurabi : Introduction". Yale University. Retrieved 14 September 2007.
speechisfire.com – Includes soundfiles with extracts from the Code being read in Babylonian by a modern scholar. Hammurabi's Code, Blaise Joseph, Clio History Journal, 2009. ↑ Gabriele Bartz, Eberhard König, (Arts and Architecture), Könemann, Köln, (2005), ISBN 3-8331-1943-8. The laws were based with scaled punishments, adjusting "an eye for an eye" depending on social status. ↑ "Hammurabi's Code" , Think Quest, retrieved on 2 Nov 2011. ↑ "Law Code of Hammurabi, king of Babylon" , Louvre , retrieved on 29 Nov 2013. ↑ L. W. King (2005). "The Code of Hammurabi: Translated by L. W. King". Yale University. Retrieved 14 September 2007. ↑ "The Code of Hammurabi: Introduction," , Ancient History Sourcebook, March 1998, retrieved on 2 November 2011. ↑ Barton, G.A: Archaeology and the Bible. University of Michigan Library, 2009, (originally published in 1916 by American Sunday-School Union) p.406. ↑ Barton 2009, p.406. Barton, a scientist of Semitic languages at the University of Pennsylvania from 1922 to 1931, stated that while there are similarities between the Mosaic Law and the Code of Hammurabi, a study of the entirety of both laws "convinces the student that the laws of the Old Testament are in no essential way dependent upon the Babylonian laws." He states that "such resemblances" arose from "a similarity of antecedents and of general intellectual outlook" between the two cultures, but that "the striking differences show that there was no direct borrowing." ↑ "The Code of Hammurabi," , The History Guide, 3 August 2009, Retrieved on 2 November 2011. ↑ Flach, Jacques. Le Code de Hammourabi et la constitution originaire de la propriete dans l'ancienne Chaldee. (Revue historique. Paris, 1907. 8. v. 94, p. 272-289. ↑ For this alternative interpretation see Jean Bottéro, "The 'Code' of Hammurabi" in Mesopotamia: Writing, Reasoning and the Gods (University of Chicago, 1992), pp. 156–184. ↑ Fant, Clyde E. and Mitchell G. Reddish (2008), Lost Treasures of the Bible: Understanding the Bible Through Archaeological Artifacts in World Museums, Wm. B. Eerdmans Publishing Co., pg 62. This page was last modified on 30 March 2015, at 18:07.